Creamy basil green dressing can make a flat dish turn amazing, and it’s something you can make a condiment out of to keep for the week. What are some of the foods that this goes great with you ask? Just about everything! I use this dressing for my avocado toasts, morning hash browns, salads, potato soups…the list goes on! You could even tackle a really good pasta and just slather this stuff on for an extra kick. 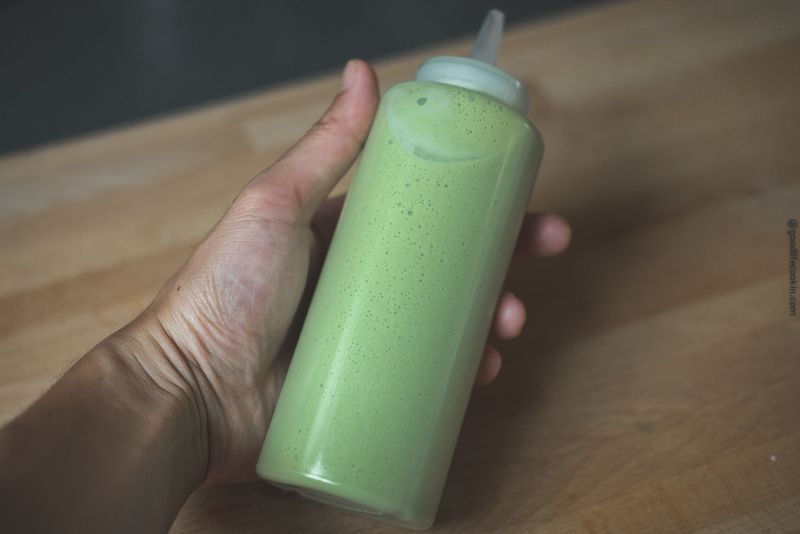 This dressing is extremely easy to make, but you will need a really solid blender to get the job done. We’ll be using cashews to give this dressing that creamy luxurious taste. I’ve recently become obsessed with cashews as a base for sauces because who doesn’t love cream?! To start, we’ll prep all of our herbs, which I’ve chosen to use a simple combination of green onion, parsley, and fresh basil. Every Sunday, there’s a local farmer’s market right down my block, and they have a vender there who offers the freshest basil I’ve ever had. The best part is, it comes with the roots, so I can just leave this in a jar of water and it will give me basil for the entire month! We’ll take some coconut oil and melt that in a small sauce pot over low heat. You can actually roast up the cashews in the oil for a little more nuttier flavor. We’ll then pour in some almond milk and a scoop of some really good miso paste to add the umami into the foundation of this dressing. Once we get this to a rolling boil, we’ll cover the pot and let it simmer on low for 20 minutes. 20 minutes should be enough time to get the cashews soft. Again, you’ll need a good blender for this, and I always recommend investing in a Vitamix for the best results. However, if you do not have a Vitamix, no worries! You just need to make sure the cashews are really soft, so I’d let this pot simmer go for 40 minutes total, just to be safe. Once the almond milk and cashews are done, we’ll let that cool until room temperature. This is super important, because we don’t want the heated sauce to cook the basil and turn it brown. Add everything into the blender along with some fresh squeezed lemon juice and let the good times roooooll! What you’ll end up with is a fresh, decadent, dressing that should have the perfect consistency. You’ll want to get this dressing into a squeeze bottle of some sort and pop it into the fridge. Cooling the mixture slightly solidifies everything and makes the dressing a perfect thickness. Thats really all there is to a great creamy basil green dressing! I’ll definitely come back for other great sauces soon so please stay tuned! Thanks for your support and have fun livin’ that Goodlife! Let mixture cool to room temperature and add to blender. Prepare fresh basil leaves, diced green onions, and parsley and add to blender. Add fresh squeezed lemon juice, 1 tbsp Vegan mayonnaise, and a pinch of salt to blend until dressing is smooth.